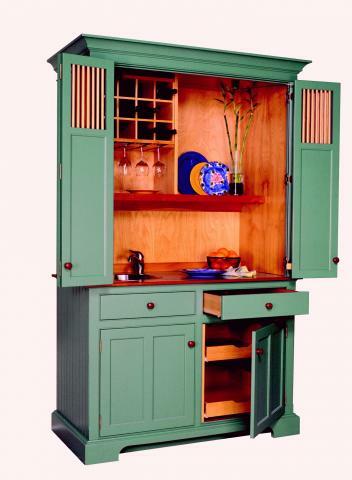 It is an exceptional armoire that is great as a stand-alone pantry unit or can be one of four to five pieces typically used to create a YesterTec open plan kitchen. This incredible piece from YesterTec’s line of Kitchen Workstation Furniture allows the consumer to control what they want to see by hiding many of the things they don’t want to see. Specifically, it hides Clutter. Clutter is typically found along the back edge of most counter tops, up against the back splash. Most of the time clutter just sits there, hogging countertop space while leaving little work space in front for food preparation. In fact, clutter is the main reason why we think we need so much counter space to prepare a decent meal. 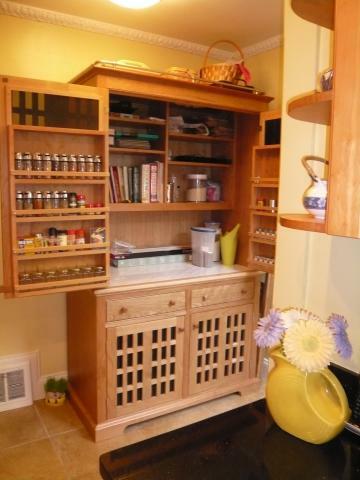 By concealing the clutter, The Working Pantry gives the consumer A MAJOR CHOICE in how a kitchen is organized. The key to the (WP48) Working Pantry is the hidden countertop and shelving that are enclosed by its upper bi-fold doors. Hiding the ‘clutter’ in this fashion allows it to become a very versatile piece for the kitchen, or a dedicated piece for other uses. 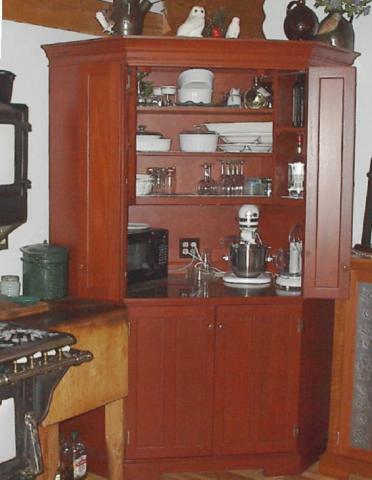 For example, a (WP48) Working Pantry can be used as a bake center, breakfast room pantry, secondary food prep area, or a bar in a kitchen environment. It can handily take the place of an old-fashioned butler’s pantry when placed between the kitchen workstations on the way to a table in an open-plan design. It’s larger cousin (the WP54 that includes an undercounter refrigerator) is so exceptional it can’t live only in the kitchen! 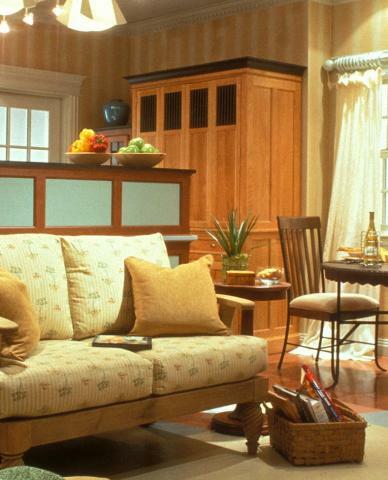 It can be used as a dedicated snack center/bar in a master bedroom, guest bedroom, mother-in-law suite, hotel suite, media room, office or living room. Please contact us to see a complete list of our Hospitality Center models and their ballpark prices. Maybe even a spa bathroom? The possibilities are endless, but in all instances, they conceal visual and functional ‘Clutter’ behind doors and beautify the space in a very simple way. 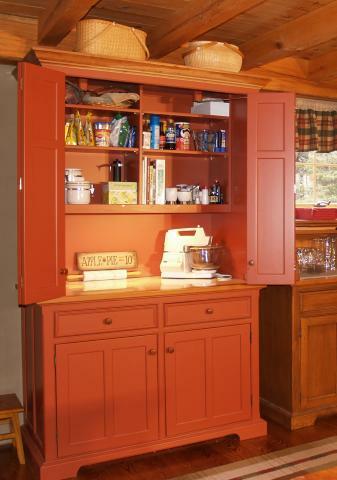 YesterTec Working Pantries are integral to YesterTec’s line of 250 models of Kitchen Workstation Furniture and are available in pine, maple, cherry, mahogany, quartersawn white oak or painted finishes. They measure 83 ½” total height, and minimum 50 ½” wide (WP48) and 56 ½” wide (WP54). 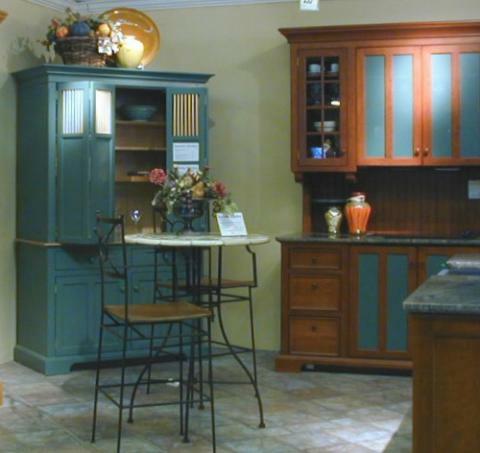 Both can be ordered with flush, vertical bead-board or flat panel sides, various cornice and door styles. Design freedom can be achieved by mixing styles, colors, shapes and textures using the same design techniques that are used in other rooms. Typical interior options include LED lights, cutlery inserts, cooking utensil inserts, spice inserts, ironing board and more. Worktops can be specified in solid cherry, butcher block, stone or laminate. By enclosing the countertop, small modern appliances can be concealed to maintain the character of a ‘period’ styled room. If more storage is required, the WP48 can be built as a ‘Tina’s Pantry’ model that features all storage and no countertop behind the upper doors, with fold-out pivoting shelving completely filling the space. This piece above and below is equipped with a sink so it also doubles as a bar and is a wonderful convenience in a crowded kitchen where everyone congregates and where extra sink space is needed. The doors shown here feature dowel vents to allow air to move freely to dissipate lingering moisture from the sink. The interior options shown here include a built-in wine rack and stem-glass holder and a sink with a working countertop. When the doors are open the full depth worktop is revealed with open shelving above. The open shelving keeps everything in view and easily accessible and the piece is designed to conveniently store small electrical appliances that can be used at a moments notice. But the real beauty of this piece is that you can make a mess and then hide it! 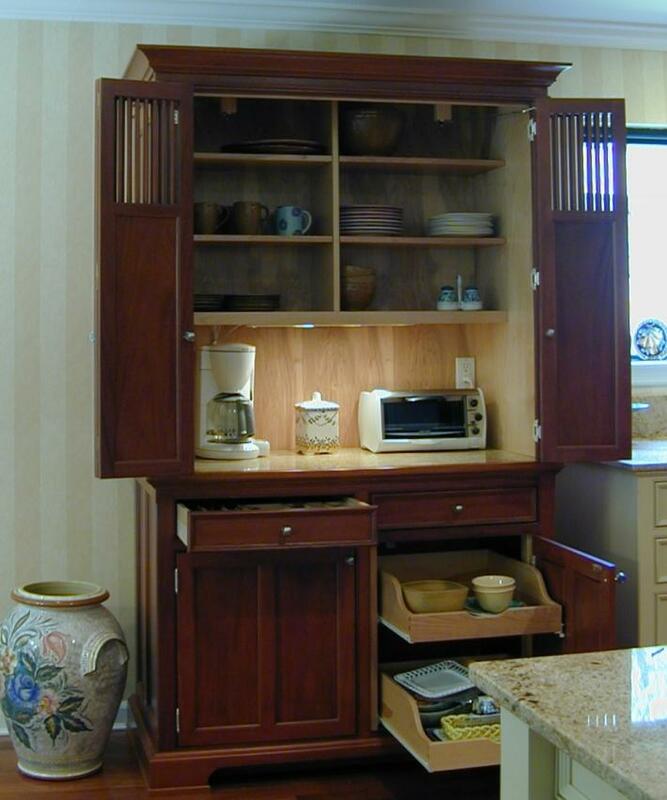 Just close the doors to conceal a food prep area right before the guests arrive. And, the bi-fold doors are appropriate if there is limited area surrounding the unit since these doors occupy only a small space when they are opened. 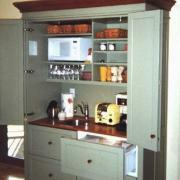 The bottom section features pull out full-extension storage drawers with utensil inserts and pull out shelves.